Jesus was never looking for a vacation. Here He is in this passage - "on tour" so to speak - by boat across the Sea of Galilee - then on foot. He was preaching, speaking, meeting, greeting - with some exorcism and healing mixed in. I mean - this account really begins in Matthew 8 with Jesus in Capernum. They take a boat across the Sea of Galilee - and then they walk to Gadara (I mean - it doesn't say - but let's assume they didn't call an Uber at any rate. And from there they head to Nazareth - first over the Sea of Galliee again - and the rest of the way on foot. All in all - two lengthy lake crossings and about 20 miles of walking. Okay - forgive me the blow-by-blow road trip itinerary. When was the last time you crossed a lake - twice - on a trip? Even if there was a sail on both of the boats - this was a LOT of work. When was the time you mixed your little boat trips up with a 20 mile walk? I don't know about you - but when I come home from work - I'm beat. I relish my quiet moments after returning home. Can you imagine coming back home after a trip like that and finding that a crowd has gathered at your front door? Not just any ol' crowd that's just coincidentally walking by - but a crowd that's specifically looking for you - to lead them? This was the furthest possible thing from a burden to Jesus though. Not only was encountering just such crowds Jesus actual purpose at this point - but He loved seeing these people. He loved interacting with them. He hated that they felt so lost and without a shepherd. While He was sure limited by His body in the same way we are - He had the advantage of being in His element in these moments. 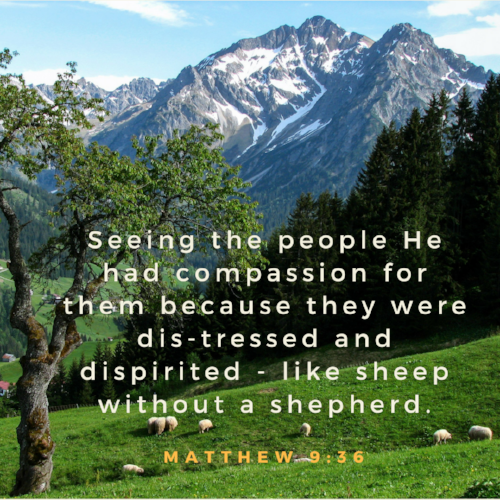 Jesus looking on those directionless, leaderless masses and feeling compassion for them was utterly natural to Him. March 05, 2018 /JC's Village C.C.M.